Conway National Park is home to the Whitsunday Great Walk; a 28km point-to-point multi-purpose trail open to mountain bikers and hikers. 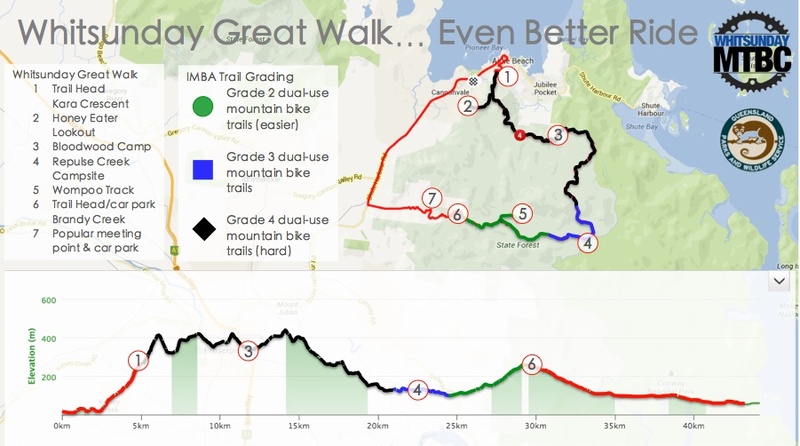 The Whitsunday Great Walk has something for everyone!! From the Brandy Creek end you can ride the green (grade 2) trails down to Impulse creek – this includes the Wompoo track (map reference 8). All up there is 10km of green trail. This trail is suited to those looking for some fast, flowing fun! Take it easy on the way in as there are many swift corners and hidden creek crossings with large exposed rocks providing a thrilling and fun ride. Continuing on past Impulse Creek moves into blue (grade 3) trail for 2km; take care crossing the creek, stick to the mesh as the crossing can be very slippery and only cross if the water level is safe. Many riders turn around here and head back to the car park. At the footbridge the trail moves into black (grade 4) trail. If you continue on from here be prepared: the trail is remote, water is available but should be treated and mobile access is limited. However, for those that dare to venture on, the rewards are sweet with fantastic single-track flowing through the pristine Conway National Park all the way into Airlie Beach. The trail head at Airlie Beach is located at the top of Kara Crescent. If you’re looking for maximum grade 4 fun in minimum time – we suggest the Honey Eater Lookout. This trail turns off the main trail, it is 4km from the trail head to the top of the lookout. Take lots of water – there are water tanks on the trail but it should be treated before drinking. Insect repellent is also recommended.